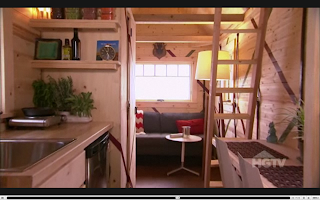 The HGTV Design Star show chose the tiny houses for three finalist in Episode #9. Each house was a shell when the contestants entered. 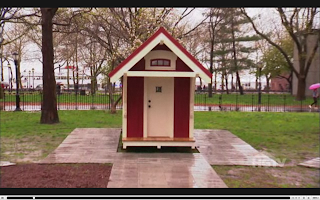 Finally, a look at how these tiny spaces can be turned into something very special. 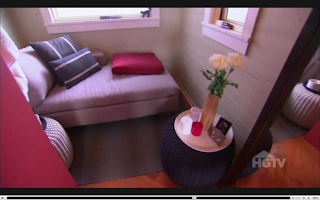 Three designers, Meg, Carl and Mark were give the challenge of designing the tiny space in a short period of time. I wondered if they could create a very tiny house with ALL the amenities you would need to live for a week/month/year. I don't know what you think but I was inspired by their designs. 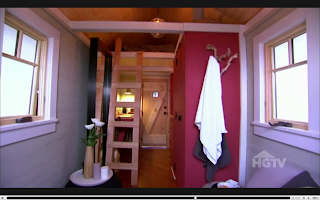 When you turn three very talented up and coming designers loose on a challenge to do a whole house, all be it small, you have something worth looking at. Each designer was given a carpenter to help build the interiors and then a short period of time to bring in the design elements. Mark's house was a beautiful design but the lines all over everything seemed to confuse the issue. 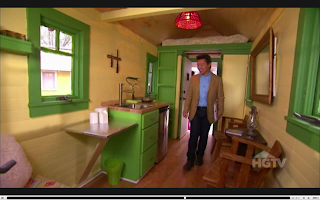 I think he even managed to include a dishwasher. 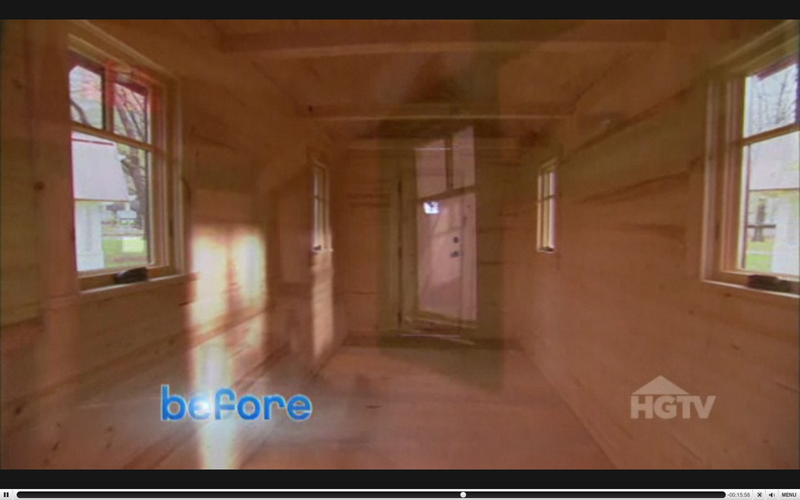 The bump out in the middle of the room is a bathroom. The ladder leads to a loft area with storage. The judges were not as impressed as they could have been even though they did acknowledge his artistic talent. Puff Pillow/table in lounge area. 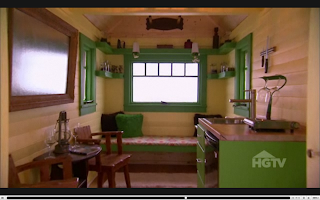 I loved Carl's tiny house personally. It was a bit more sophisticated and finished. His colors, puff pillow/table idea and storage above was just wonderful. 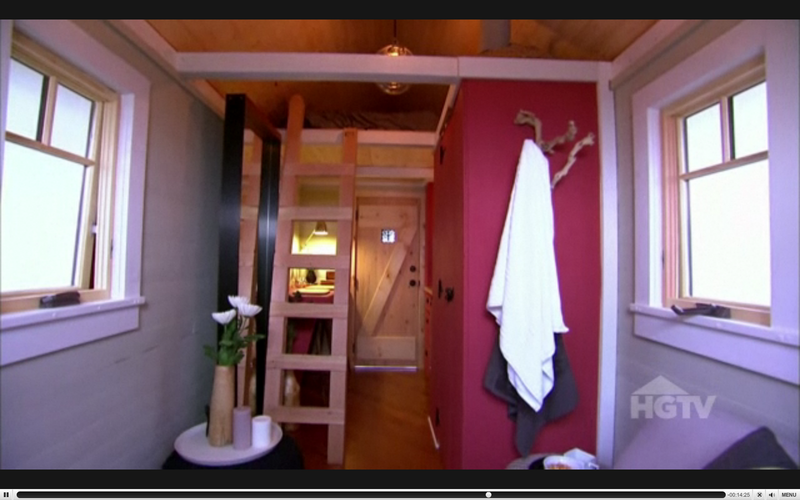 I loved the hook for towels and a vase of flowers on the small table. It actually was very spacious looking given how small it was. Meg's design was very interesting. She put the bath just inside the door. The space remained totally open when she did this. The design was very "camp cottage" looking and really didn't appeal to me personally. When I think about these tiny spaces I am taken by the notion that I could maybe spend a whole season in one without feeling deprived. After living in an RV for month at a time I am well aware that a person needs to have a space where they are comfortable. That bench in the back looks really hard! This camp look and style is just too primitive for me. Things I noticed that would make long term stays more difficult is the lack of a shower. Honestly, I would not want to do without one. I do know people that always use the public shower in camp grounds and RV resorts. It is just a personal preference for me! Take a look at the episode. It will satisfy your curiosity about very tiny space living. 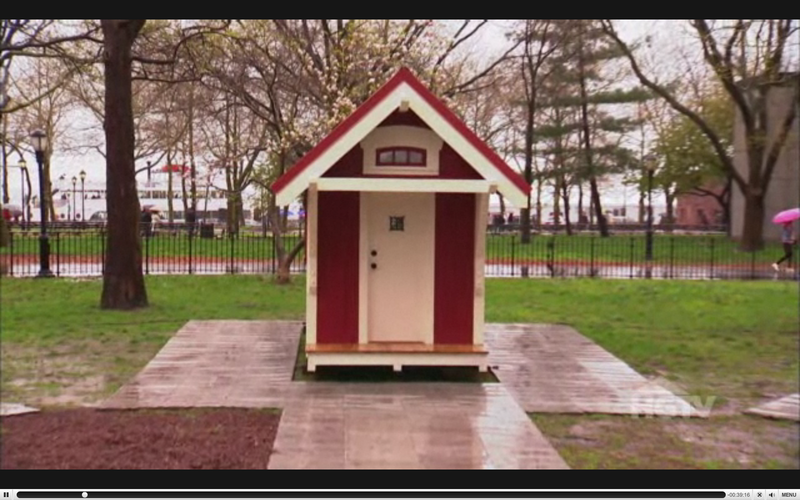 That sure is a very tiny house.